baby showers for a mamasita-to-be expecting a little girl are the most fun. i mean, if there is a better time to be just totally and unabashedly girly, please let me know about it – because i can’t think of one. 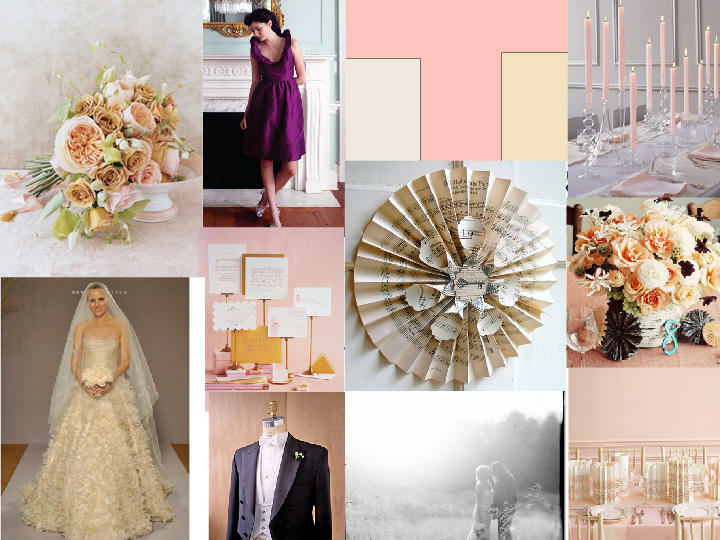 pink everywhere, busting out your best silver and crystal, chicken salad crossiant sandwiches with mimosas and tea cookies – love it! 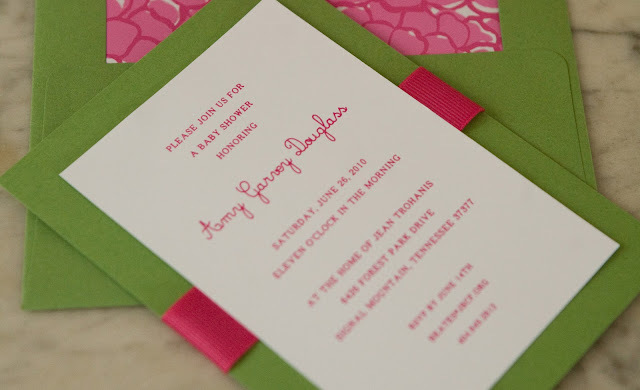 and just because the shower will be dainty doesn’t mean you have to stick to pastels for the invitation – oh no ma’am. 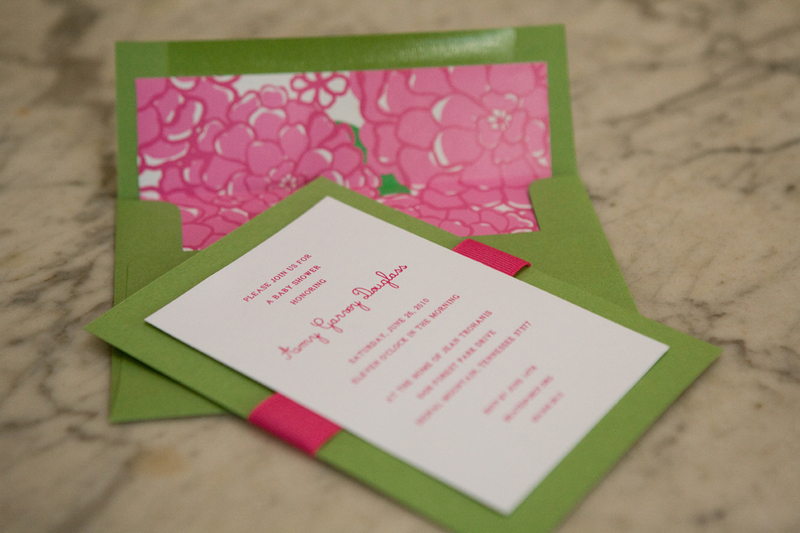 here is a baby shower invitation featuring bold pink and green with – the mother of all femininity – a lilly pulizter patterned envelope liner. we wrapped a pink grosgrain ribbon around the invitation to add one more punch of pink. 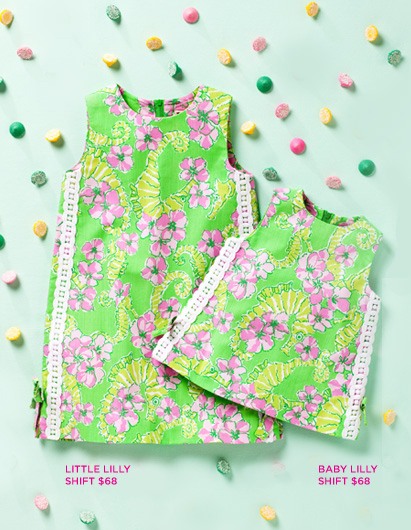 and, just because i clearly am chomping at the bit to clothe a little girl…check out what i found when i was grabbing that lilly link above. actually, now i need two little girls to don these frocks…hmm. 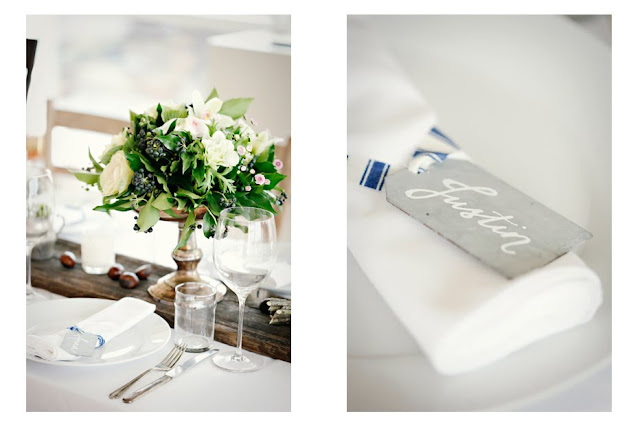 i just adore a good save the date. they’re small, cute, informational and look great slapped up on a fridge. what’s not to like? for this save the date we recently completed, we followed the cues set by the uber-talented jen dipasquale in an inspirational storyboard. she created a gorgeous palette full of soft pinks, taupes, creams and old world glamour…check it out. 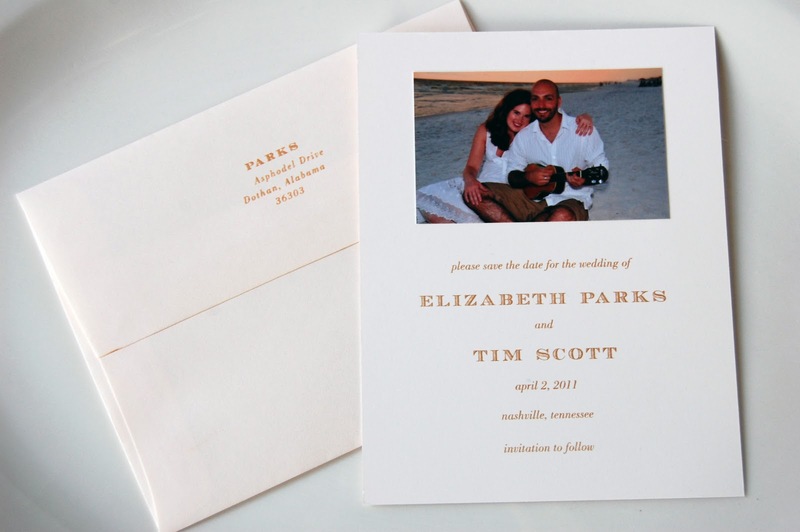 we used an ever-so-light pink envelope and cream cardstock, with a champagne colored ink printed in thermography. 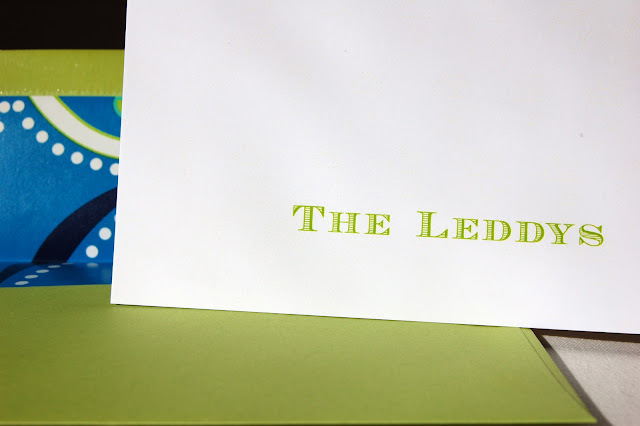 a picture of the cute couple completed the card, and off they went to the guests! we printed the hotel and travel information on the back. 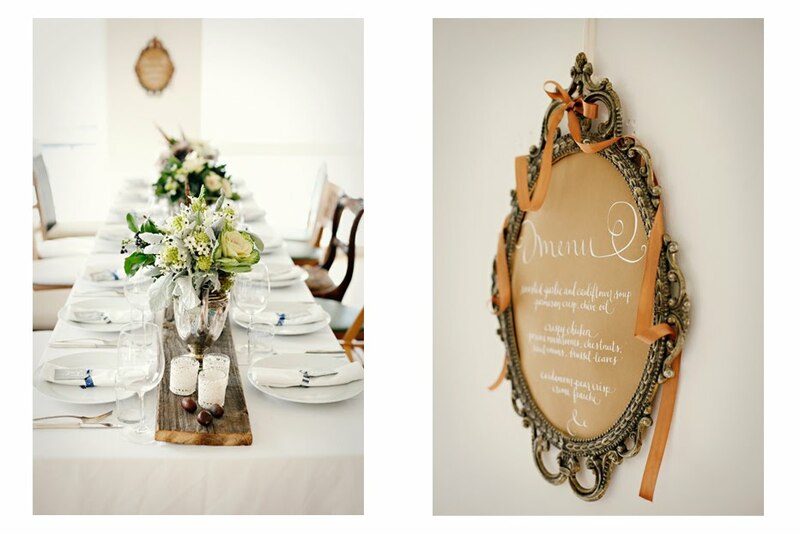 now that the color palette and style has been set, all of the other decor and paper pieces will tie into it for the big day. fabulous! giveaway winner announced – and happy thanksgiving! so here’s a secret i’m going to let you guys in on. usually i write my blog posts in the evening, tweak them in the early a.m., and then post them for all the world to see (er…if 12 people were “the world”). not today. today is LIVE BLOGGING from the calliespondence international headquarters, which also will double as the underpinnings for a thanksgiving feast tomorrow. hum, that’s funny, how is that you say? well, i do most of my business right here at my dining room table. my seat here at the head of the table gets great light, most of the time has ample layout space and if i need a snack obviously it makes things easy. something funny happened just now, which really is JUST NOW (remember we’re broadcasting live here). well, let me start earlier this morning – little man and i made a quick trip to whole foods to pick up a few things in preparation for the feast tomorrow. while i was standing in line to check out, i checked my blackberry for emails and texts. well – abbie (you may recall, the last giveaway winner whose notecards we featured on monday) texted me and said that the ‘google doodle’ (you know….the image on the google home page that is representative of something going on in the world that day) today was courtesy of ina garten, the barefoot contessa, whom i love and adore. note to self: must check out google.com today. so i go about my day, which also consisted of a doctor’s appointment with rush, as he woke in the middle of the night last night, unable to sleep because of a worsening cough. poor little thing. made me thankful for good healthcare in our country, and the ease at which i called, made an appointment, saw a doctor and was sent on my way with a prescription so my baby can feel better. we are so fortunate! then, i went to lunch with my dear friend pam who lives in denver and i don’t get to see very often – but she always makes a point to schedule lunch with me when she comes in town and i love that. i am so thankful for good friends! after that, i came home and thought about how i REALLY need to cook at least one thing immediately so i can feel like i’ve made the tiniest of dents into my thanksgiving prep. i mean, it is tomorrow after all. i had already decided to make ina’s pumpkin banana mousse tart. you have to make the crust first, bake it and then let it cool to room temperature…so that would be a good little dent to take care of. preheat the oven, crush some graham crackers, melt some butter…press the mixture into the tart pan with a measuring cup just like ina does in the picture alongside the recipe…into the oven, done! ladies and gents, do you see what that is? !﻿ it’s a friggin’ graham cracker crust even WITH the measuring cup that you use to press it into the sides and bottom of the tart pan – and when you click on the google logo, it takes you to the recipe for the pumpkin banana mousse tart recipe. so, with my #1 giveaway number drawer down and out for the count, i had to resort to random.org. first i had to figure out how it works. turns out it’s pretty simple. put in a minimum, put in a maximum (we had 15 comments)….it gives you a number. and drum roll please…..here is the winner it spit out! everyone had such wonderful comments and i LOVED hearing what all of you are thankful for. so very many different things ranging from costco, mini-pie molds from williams-sonoma, invisalign to perfect grills, sweet dogs, babies currently cooking, gravity-defying bras, bob dylan and bethenny getting married. i love it all!! what fun this has been, and thank you for taking the time to respond! giveaway winner booty – and another giveaway!! wow, thanksgiving week is here already. crazy! i am thankful for so very many things this year, i don’t even know where to start. 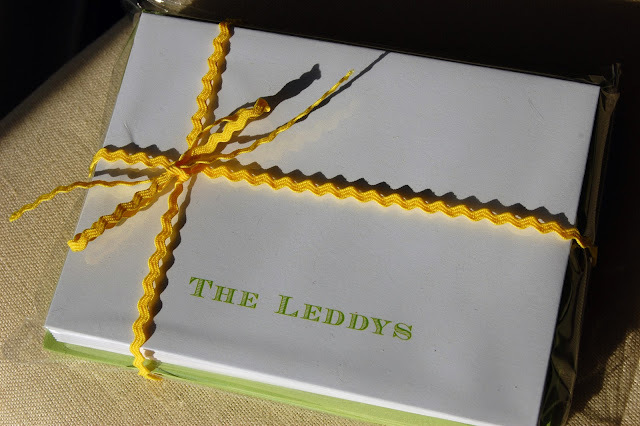 but – i think i will begin by thanking YOU, my faithful readers and clients, by doing another giveaway! yeah!! first up, don’t you wonder what abbie, the gal who won the last giveaway, got? she won a set of 12 foldover notecards with a surprise envelope liner. she chose for her notecards to say “the leddys” in a sour apple color…which we paired with matching envelopes and i selected a fun liner. i couldn’t make it too girly because her husband marty would be signing his name to these! so no flowers and no pink allowed. also, if you are engaged or expecting a baby and having showers thrown for you – these make a great gift for your hosts and hostesses! 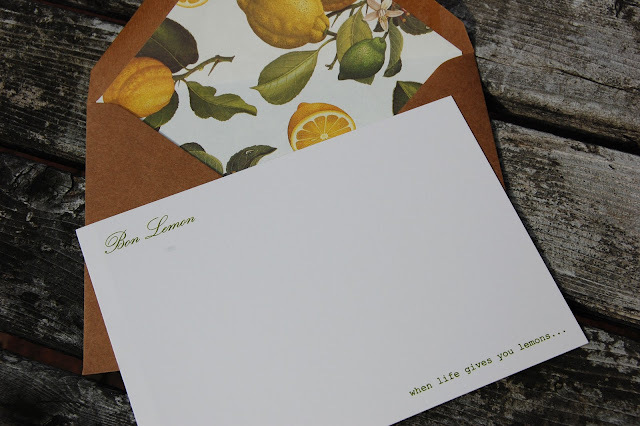 i have done this for several clients and they go over big – who doesn’t like or need personalized notecards, right? 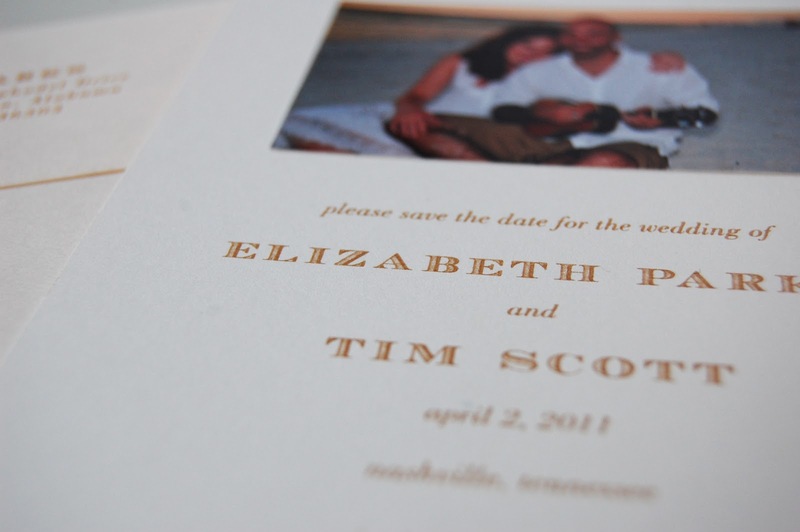 we can do first names, first and last names OR monograms. 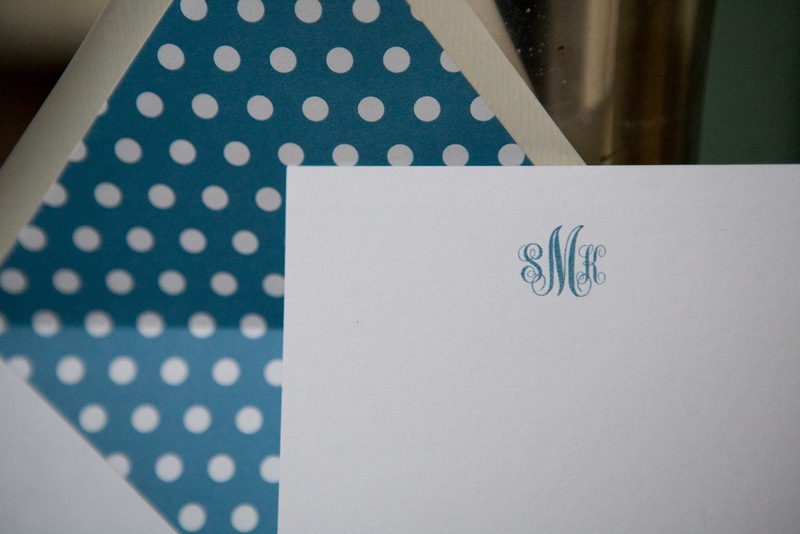 here’s an example of a monogrammed set. now. let’s get to the new giveaway!! 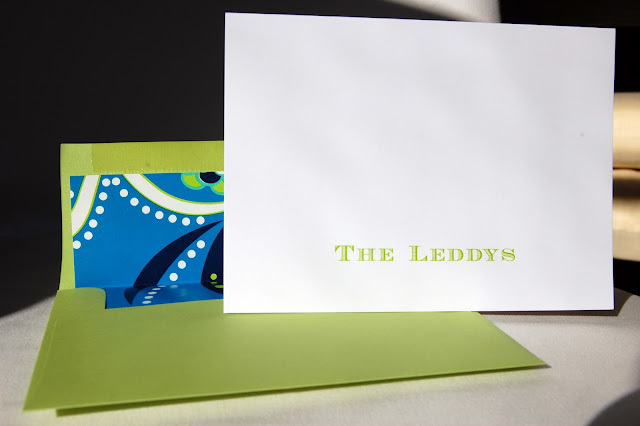 i’m going to give away a set of 20 flat printed, flat notecards with an envelope liner – and of course you tell me what you would like the text and colors to be! all you have to do is leave a comment with what you are most thankful for this thanksgiving season. my answer is: (the usuals first…) my family and their good health – a whole mess of sweet friends in my life, many of whom are the reason for calliespondence having gotten off the ground – a roof over my head and food on my table every night – God’s grace – watching rush point to where he thinks his belly button is (usually anywhere at all on his midsection) – the real housewives of beverly hills and the entertainment they bring along with them (i cannot get enough of lisa vanderpump – she’s hysterical!) – ina’s pumpkin banana mousse tart – a wonderful husband who traced over 100 envelope liners for me this weekend (thanks babe!!) – la crema chardonnay (yum. so buttery.) – all of my printers who bend over backwards to meet my crazy deadlines and off the wall specs – and all of YOU who make this venture and blog even possible. i’ll annouce the winner on wednesday! now go forth and be thankful in the comments section!! 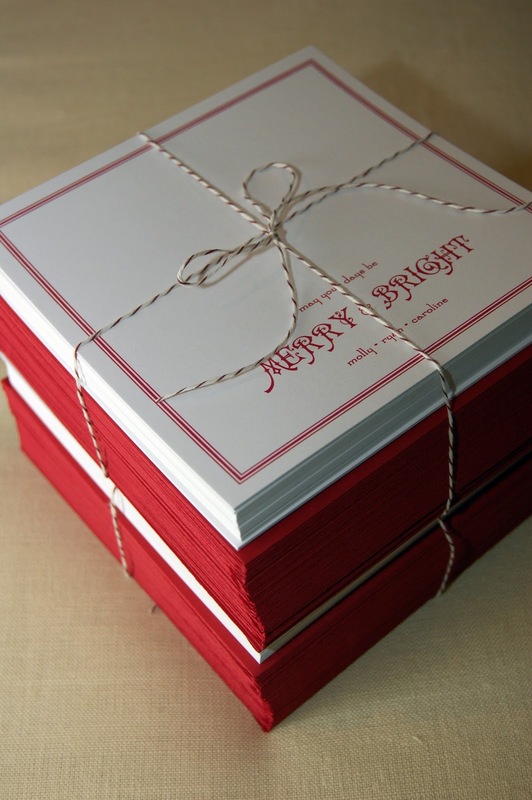 a stack of cute holiday cards ready to be affixed with a darling picture and sent out to loved ones’ mailboxes. 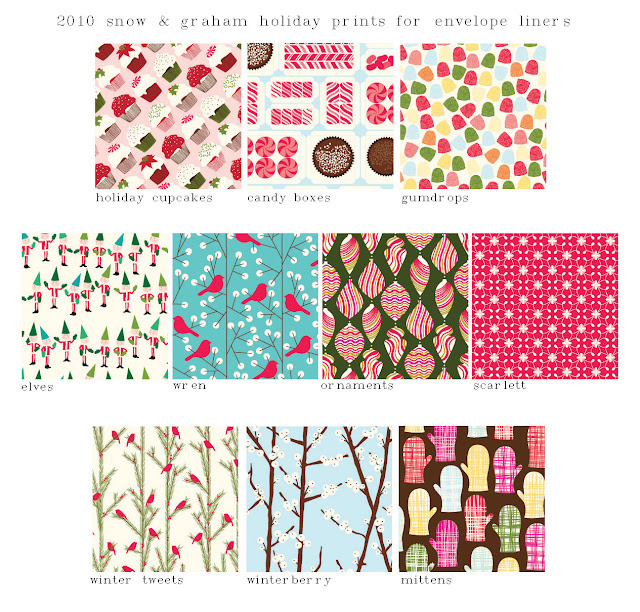 i have so many fun holiday cards to show you guys soon! 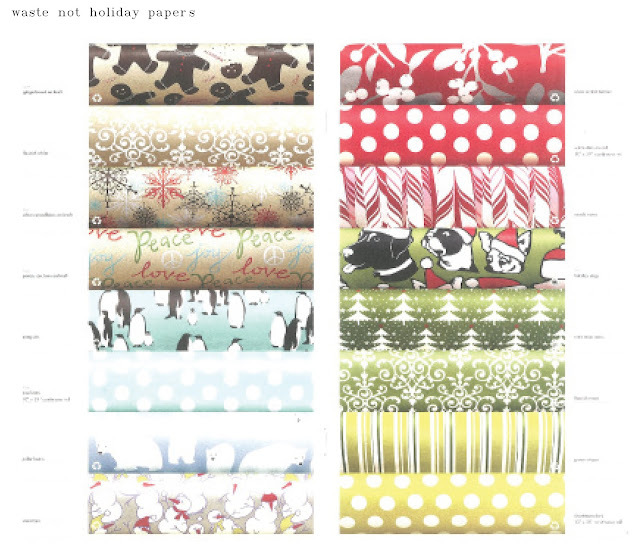 we’re taking holiday orders until december 10th. have you ordered yours yet? i thought i would show you guys the liner options i’m offering this season, too. i am in love with so many of them! aren’t those fun?! have a great weekend everybody!! james and wendy are two friends that i have known for a while now, and they are fabulous. james and i used to work together and through him, i met the lovely wendy who works for one of the coolest and most happening companies here in atlanta…SPANX. raise your hand if you are a female and don’t wear spanx any time you leave the house in a cocktail dress…no one, that’s what i thought. i mean, that’s a good product right there. anyhow, these two both hail from louisiana which means they are super fun to hang out with. i think if you’re from louisiana, fun is just in your blood. aside from all that, they just had the cutest and sweetest little boy back in may. his name is james mcmahon lewis III, but since obviously james is already called james….they came up something so cool to call him. 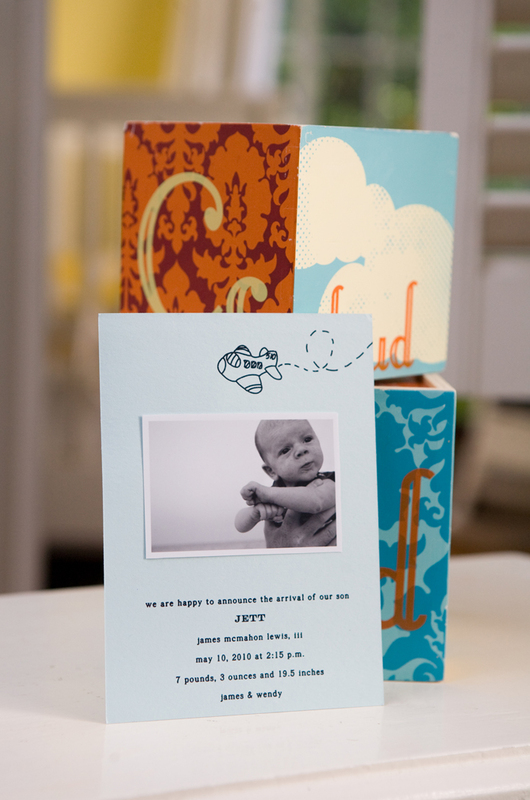 jett – take the first letter from ‘james the third’ and add an e – you get jett! love it. 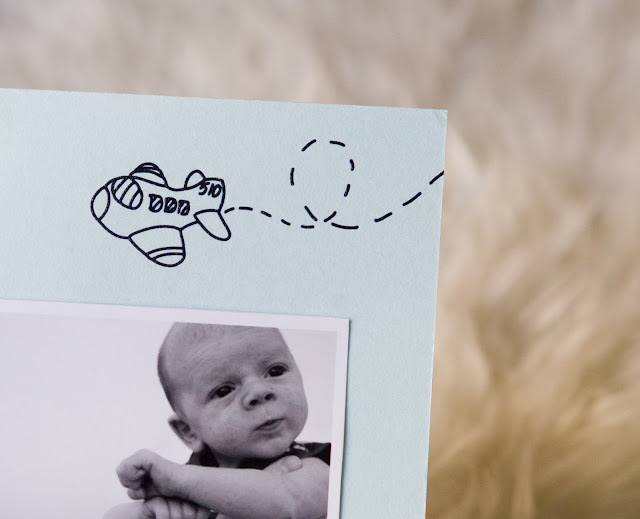 for his birth announcement, we featured a hand-drawn airplane with the numbers on the side being his birthday (jett’s birthday also happens to be his mom and dad’s anniversary…what are the chances??) and his dad was the one who sketched it! how neat is that – it made it so personal to them and was such an awesome touch. check it out. here’s a close up of the drawing that james did (510 = may 10th). they paired up nicely with navy envelopes, for which we created custom address labels. i highly recommend these for sleepless new parents! you just send us your address list and we crank them out – all you have to do is put the stamp on. easy peasy. 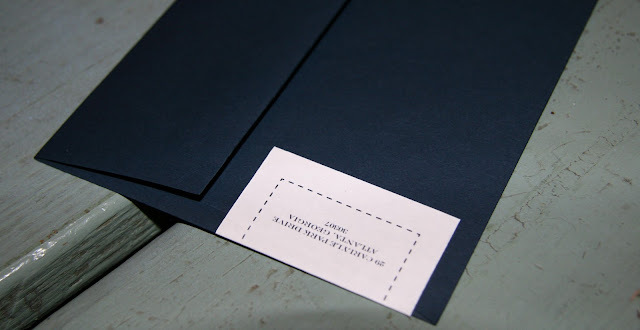 and see, the return address wraps around on the other side of the envelope. jett, you’re destined to be a blast. congrats james and wendy! …that calliespondence designs business papers, in addition to social papers? 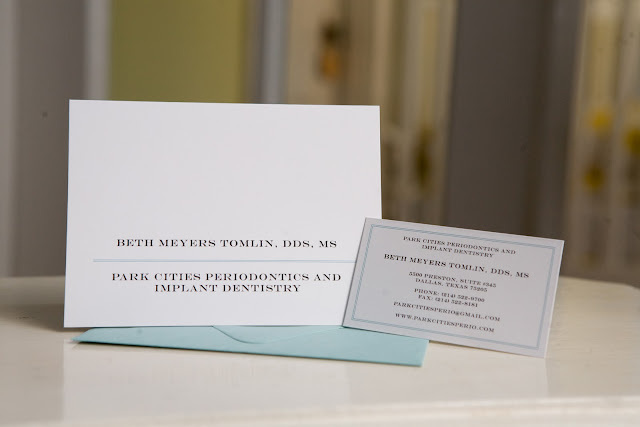 check out these foldover notecards and business cards we did for our favorite dentist in dallas – dr. beth meyers tomlin. the business cards even have a little map and a place for your next appointment on the back – how cute! 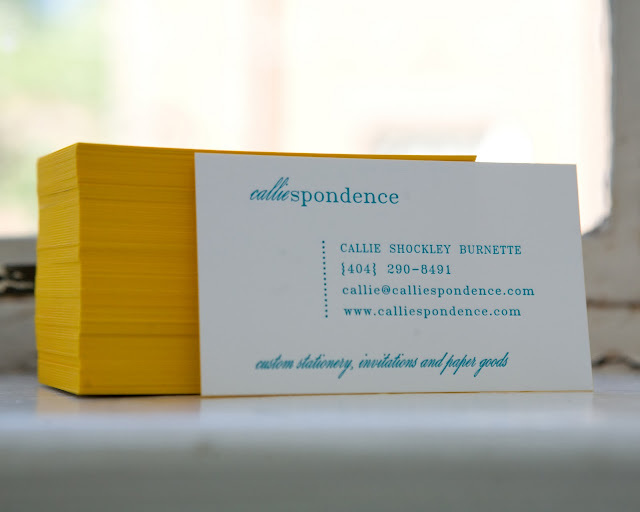 and of course calliespondence needed business cards. here they are, letterpressed in teal ink and edge painted in yellow. by the way, every time i hear ‘teal’ now i think of that girl from the millionaire matchmaker who got set up with that dude zagros. did y’all see that episode? or am i just a bravo junkie? 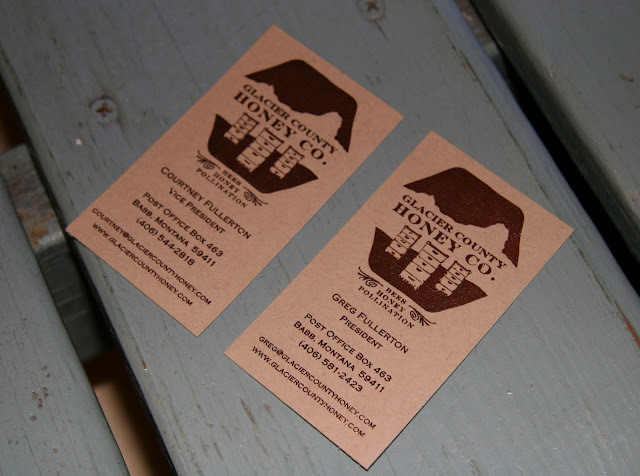 here are some more business cards, recently completed for the AWESOME folks at glacier county honey company, located in babb, montana. 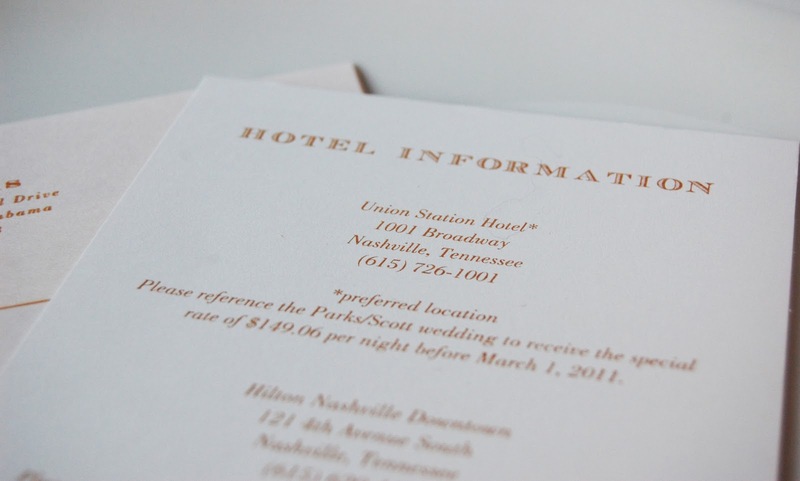 we printed dark brown thermography ink on ultra thick kraft paper…yummy. but not as yummy as their honey (it’s really good). and really, what could be better for your business than putting a fabulous foot forward in the way of good paper wares! i’m a little under the weather today and don’t have the brain power for a regular post…so here are some pretty images to daydream over. i know i will be! 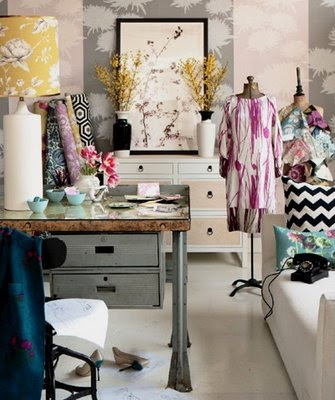 i want to be a fashion designer just so i can have this office. i would love to write some letters here. i think about this image all the time. 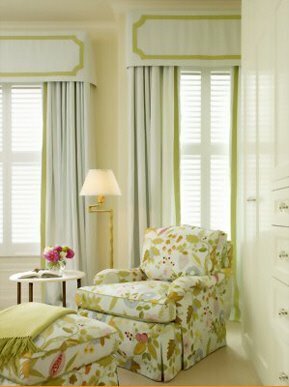 that pattern…that chair…those curtains…that lamp…utter perfection. 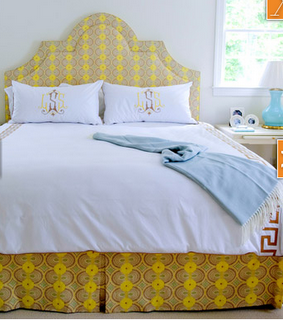 how friggin’ fabulous is that headboard/bedskirt fabric and those monogrammed pillows. bananas. 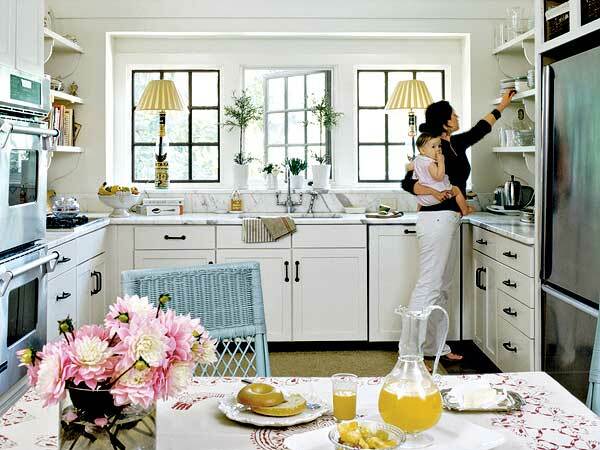 i don’t know who this lady is, but i wouldn’t mind having her kitchen. those windows? swoon. 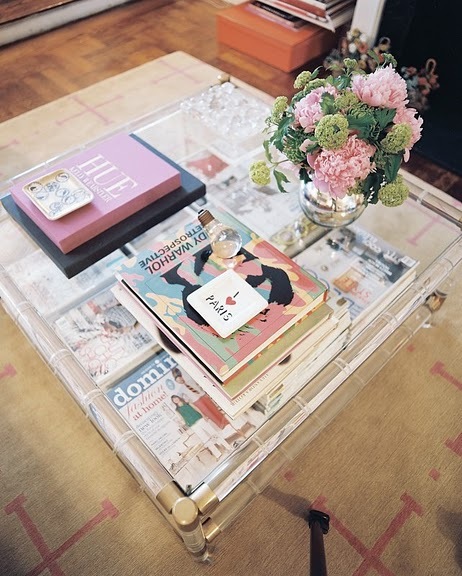 my next household “get” is going to be a lucite coffee table…oh yes. 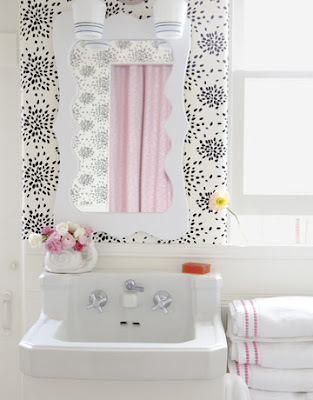 perfect girly bathroom, i.e., rbb would never let me get away with this. is that not the coolest basement play room you’ve ever seen? 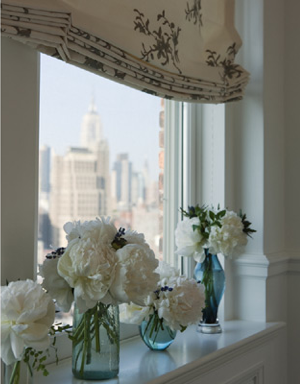 and there are some pretty white peonies for you this monday. or peronis, as rbb thinks they are called. you can’t go wrong with the classics. cast iron bedframes, silver serving trays, your grandmother’s recipe for cheese straws, a chanel suit (one day, i will own you! ), a sidecar cocktail. these things will always be fashionable in their traditionality, and are always in good taste. one thing we could add to that list is a ladies’ monogram in a scroll font – there is just something so graceful and feminine about it…you can’t go wrong with it! 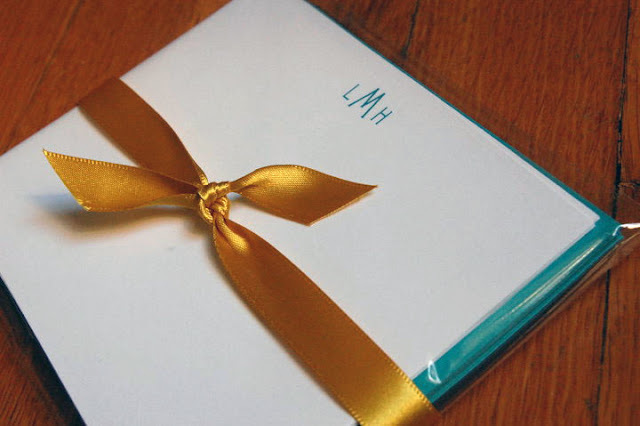 my cousin sophie (whose fabulous wedding you may recall) asked me to design her some notecards featuring her monogram, for all of those thank you notes a bride writes over the course of an engagement. 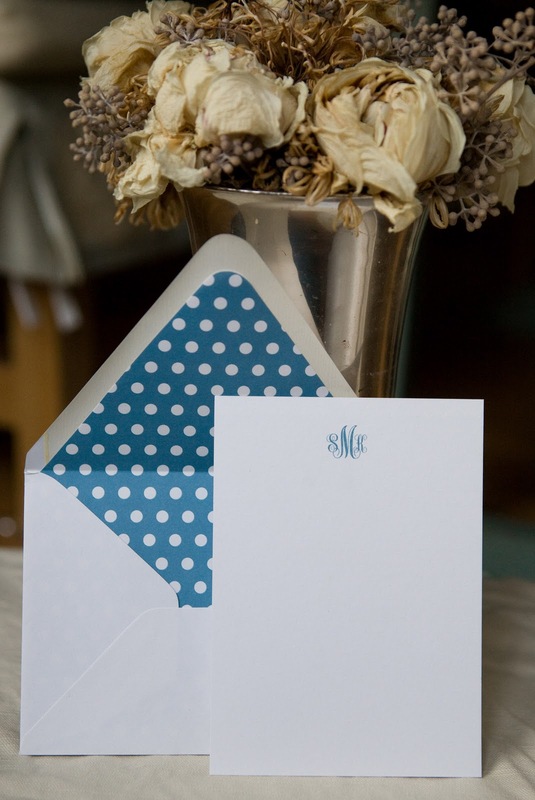 she chose a blue ink color that we printed in thermography on white paper and white envelopes to match with a cute polka dot liner. just a side note…the dried flowers in the vase are from my and rbb’s wedding day (arranged by the irrepressible jen dipasquale). coincidentally, we are celebrating our anniversary on sunday! hope you all have wonderful weekends! ok, so we all agree it’s november…how it got to be november, i’m not quite sure. it’s not too cool here in georgia yet, but i know old man winter is lurking right around the corner, bringing with him cozy sweaters, casseroles and warm apple cider. love it! 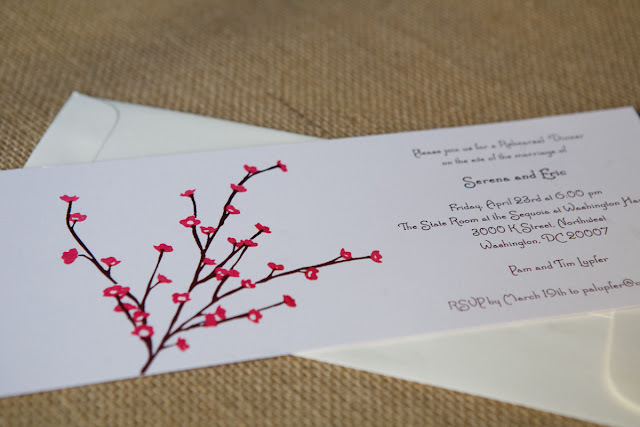 but before all that happens, here’s something that will transport you back to spring…cherry blossoms on an invitation for a washington, DC rehearsal dinner in april. what could say spring in DC more?? and don’t think this is the last you’ll see of this couple, serena and eric…there is much more to come on these two and their big day this past spring!! 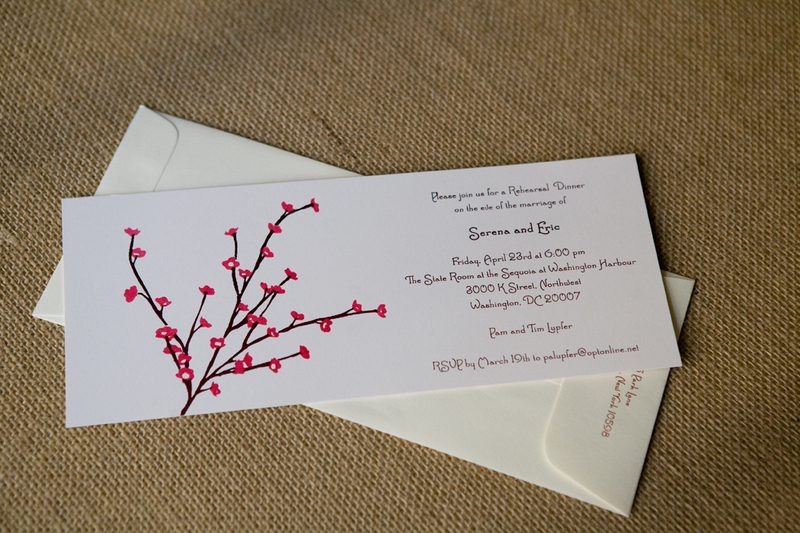 for their rehearsal dinner invitation, we used a cream #10 envelope format on which to fashion the 2-color thermography design. we printed the host’s return address on the tiny back flat of the #10 envelope…it is SO nice to not have to worry about that.